I know I’m forgetting a few, but I figured that was enough. It does really take your breath away. It’s worth noting that the only actual arrests were made outside of the U.S. If you’re a U.S. felonious company, pay your fine and just be more careful next time. There’s not even a deterrent to getting caught, since the fines are less than the gains. Just the costs of doing (fraudulent) business. The greatest challenge we all face is neither confronting the egregious behaviors of TBTF Banks or the continuous revelations of many venalities arising from regulatory capture, it is our own tumbling towards cynicism or worse–a bland acceptance that these travesties are simply smart business as usual. James, Good luck tomorrow. 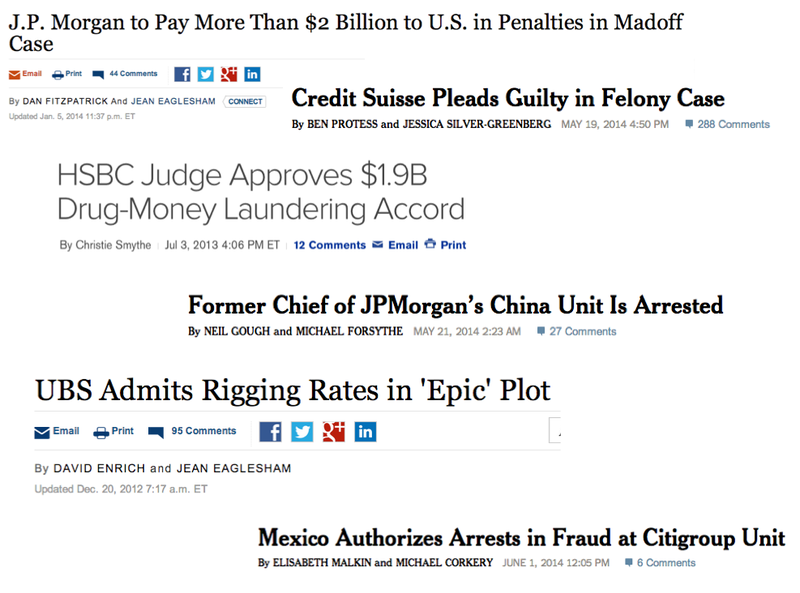 You can tell it like it is, which is the ongoing criminal financial element killing our world. Let’s see your talk go viral. Appeal to the ethics and morals of the young to combat the jaded oligarchy that has destroyed American democracy. We can take it back if we work together very hard. I believe in you James. Christina, you can’t very well take anything back working together very hard, in a soft economy, you’re about to trick yourself into a wrong doing. Don’t forget Goldman Sachs has been called on the carpet for its HFT practices. This was in early May of this year. A lot of those activities which were causing very strange price movements on the exchanges were curbed RIGHT AFTER Schneiderman said he was looking into it (and people always curb LEGAL activities don’t they??? You stopped driving your car after that speeding ticket didn’t you??). Of course the Justice Department followed Schneiderman’s lead once the sans testicles Eric Holder thought he could get some headlines out of it to disrupt attention from his “Fast and Furious” fiasco (which the little d i c k-less twerp is still scared they’re going to get him for. Of course, if the keystone cops “Fast and Furious” operation had worked Eric Holder would have told us the base of operations was being run from his office desk seat step-by-step as he gave detailed instruction by headset microphone, at which point at the [hypothetical] press conference announcing “Fast and Furious” success all Dept of Justice employees would have laughed coffee out of their nose). Liceform programming – incapable of understanding that when their host gets sucked dry, they die next. The iniquity is at the top, though. 911 was an inside job. Somehow, the “cynicism” doesn’t extend to that event being orchestrated as the greatest “deadbeat” feat ever…how far they go not to pay…. No one has a DUTY to be “ruled” by the insane – thought everyone figured that out after WWII…. I’m always detecting that troubling link with you Moses, but i’m gonna let it slide until the very end, cause you wouldn’t have it any other way. Head on, you obviously missed the bus somewhere. wound up here Worse Than We Even Imagined | The Baseline Scenario. Extremely useful info specifically the closing phase :) I deal with such information a lot. The Middle East situation – all the “revolutions” – is a DIRECT RESULT of there never being a Nuremberg-like Trial where the whole world stops as “crimes against humanity” are clearly spelled out and the case is made for who is guilty of using “ism” wars to commit those crimes. As MSM blathered on endlessly this week, reviewing the 20 year anniversary of the OJSimpson trial for murder and how for a generation of viewers, that was their moon-landing event, how they all stopped to watch together and everyone remembers where they were…. A review of the Iraq 2003 “visit” from USA should be just as judicially entertaining, no? It’s all about the $$$$ – there was no booty from Iraq to off set the 6 trillion (or wha’ever), so they got the taxpayers to provide booty to the banksters, anyway…. Russia and China need to step up and have that Trial. Otherwise, the Middle East will blow itself up rather than live with the bat sht crazy nihilism and anarchy of banksters enforcing the GLOBAL interests of the War, Drug and Slave Lords – that being their NWO “ism” that HUMAN BEINGS DO NOT HAVE THE INALIENABLE RIGHT TO MAKE THEIR LIVES LESS MISERABLE THROUGH HONEST WORK. desire to recommend you some attention-grabbing things or tips.